Society jokes about the strained relationship between mother-in-laws and their child's spouse. Of course, this is true for some, but there are many of these relationships that are good and loving. No matter what your relationship with your mother-in-law looks like, you can show her your true feelings as you celebrate her on her birthday. Tell your husband's mom how much she means to you on her birthday. Am I Turning Into My Mother? Strengthen the bond between you and your mother-in-law with these sweet messages. Thank you for raising such a wonderful husband for me. You must have done something right to raise such a gentleman! Happy Birthday! I didn't choose my husband based on who his mother was, but if that would have been the criteria, I still would have chosen him. I love you and hope you have a great birthday. Even if you weren't my mother-in-law, I'd seek you out as my friend. Happy Birthday! When I was looking for a husband, one thing I looked for was a "Mama's Boy." I knew a man who loved his mother would also know how to love his wife. I'm thankful that I found that man - and I'm thankful for the woman who first taught him to love. Happy Mother's Day, Mom. I'm thankful to share a last name with such a wonderful woman. Happy birthday! I prayed for the right husband. I prayed for a man who would be a good example, supporter, and friend. I didn't know that I would also be blessed with a wonderful woman who fulfils those roles. So happy to call you mother-in-law. Happy birthday! Because of the example you set, the excellence you insisted upon, and the integrity you displayed, my children have an amazing dad and I have a wonderful husband. On your birthday, I want you to know that I am so thankful for the person you are and the person you taught him to be. Happiest of birthdays! For a mother-in-law with a good sense of humor, consider a silly or snarky option. I don't hate you any more, and I hope the feeling is mutual! Happy Birthday to my favorite mother-in-law! I would have made you a cake for your birthday, but your son says that my baking never measures up to yours, so I didn't bother. Happy birthday, anyway! Sorry for what I said about you last night during the fight with your son. Happy birthday! 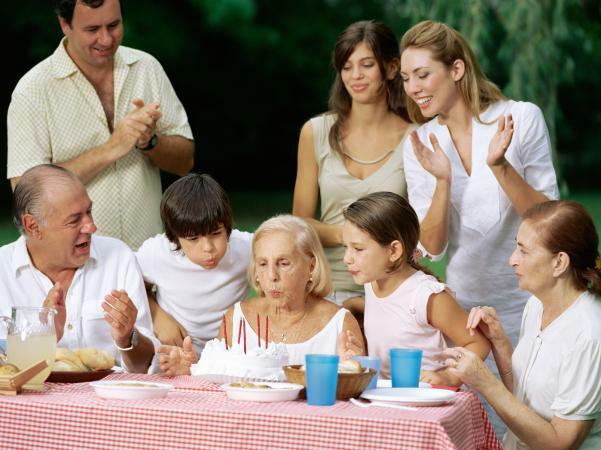 To celebrate your birthday I didn't clean the house, made your son do the laundry, and fed your grandkids a cup of sugar for dinner. I wanted you to have some new things to criticize. Have a fun birthday! Thank you for always giving me something to fight about with my husband! Happy birthday! I'm not as bad as you think I am, because I'm sending you a nice birthday wish this year! Show your wife's mother how you feel this year as you celebrate her birthday. Make your mother-in-law's birthday even more special with these nice notes. Thank you for raising the perfect wife and mother for my children. With you as her example, there is no way she could be anything less than amazing. I hope you have a birthday as special as you are. Society says I should hate you, but I have never been known to follow social norms. I am so thankful to have a mother-in-law who respects and loves me. Happy birthday, Mom! When I got married, I had no idea that I would be gaining a mother like you. Thank you for accepting me into your family and heart. Happy Birthday! We may not see eye-to-eye on everything, but I respect you and appreciate the love you pour into my life and relationship. I'm happy to have you as a mother-in-law. Happy birthday! I'm thankful that on my wedding day, I gained a second mom. I know you didn't birth me, but I feel as connected to you as if I were your own son. Thank you for making me feel loved. Have a wonderful birthday and many more to come. I'm so glad that you are not only my mother-in-law, but also my mother-in-heart. You have shown me what unconditional love looks like and I'm thankful that you taught your daughter how to love and be loved, too. Happy birthday! Thank you for teaching my wife how to be a lady, how to care for her husband and children, and how to be a good person. Because of your selflessness, I have an amazing wife! Happy birthday! A fun-loving mother-in-law with a good sense of humor might enjoy some options that bring out the chuckles (or groans). Congratulations! For your birthday, I got you the best son-in-law in the world! Aren't you glad to have me? Since I know you love to bake, I am letting you bake the cake for me and my wife for your dessert! I'm just nice like that! Happy Birthday! I'm sorry for all the names I've called you and all the things I've said... Hey! I never said they were THAT bad! Have a happy birthday! So thankful I married your daughter and am now in your will! Happy birthday! Happy birthday mother-in-law. And for your gift, I promise to stop referring to you as "the old gal" behind your back. They always say that you should look at a woman's mother before you marry her because some day she will look like her mom. Thank goodness she has good genes! Thanks a bunch, Mom! If nothing above strikes your fancy, you'll find plenty of additional options at these websites. They are all in list format, so you may need to read through them to find the right option. 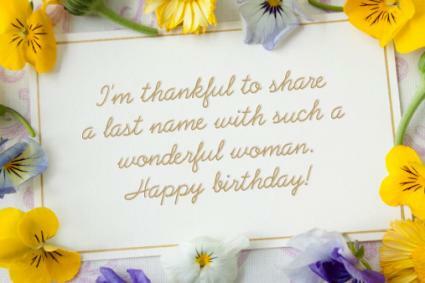 WishesGreeting.com offers 105 birthday messages for a mother-in-law. 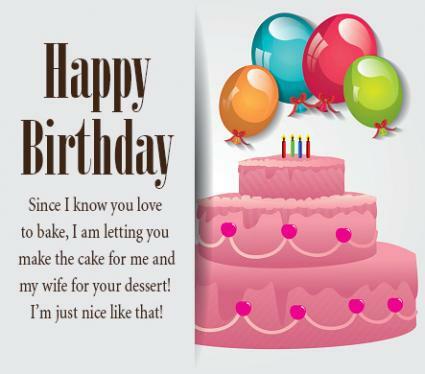 My Happy Birthday Wishes features 47 birthday messages for your spouse's mom illustrated with graphics. Birthday Wishes is a page full of birthday messages and poems for your mom-in-law. BrandonGaille.com has 42 nice messages to a mother-in-law on this page. Happy Birthday Wishes World includes both sweet and funny messages. If you're not sure what type of message to send to your mother-in-law, it is probably best to go with a nice or sentimental type of quote. While a funny message might make you giggle, it may not be received in the same way. Choose your funny statements wisely and ask your spouse if their mother might take offense at it before you send it. Being respectful and nice is never a bad idea.